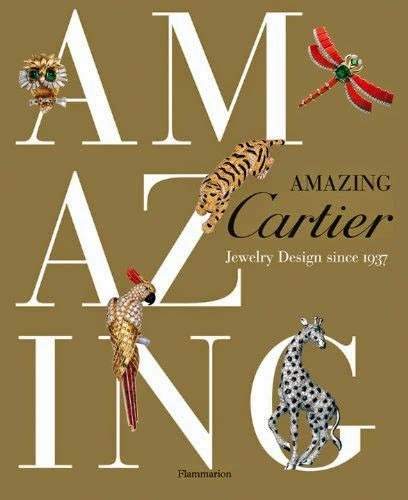 The holidays always get me thinking about jewelry, whether costume or fine, so that, plus the gorgeous book Amazing Cartier: Jewelry Design Since 1937 by Nadine Coleno, which I’ve had checked out from the library for months, means I really have gems on my mind these days! Can’t seem to give this book back to the library! A 1956 picture of Grace from the book Amazing Cartier. 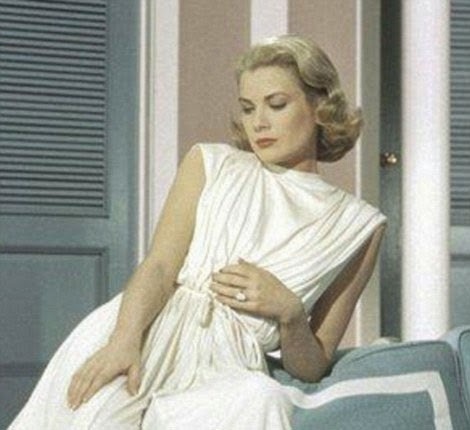 In Amazing Cartier, I came across a lovely picture of Grace Kelly, by then Princess Grace of Monaco, wearing a stunning Cartier diamond necklace that was a wedding gift to her. The 1953 necklace is made of platinum with 64 carats of brilliant and baguette-cut diamonds. It’s an interesting combination, those big round diamonds set next to baguette-cut stones. I love this look on her with the big diamonds and the big up-swept hair (what do you think, a fall, maybe?). The text did not say so, but I bet the earrings and brooch she also wears in the photo are set with both rubies and diamonds to represent red and white, the official colors of Monaco. Grace’s Cartier diamond engagement ring. 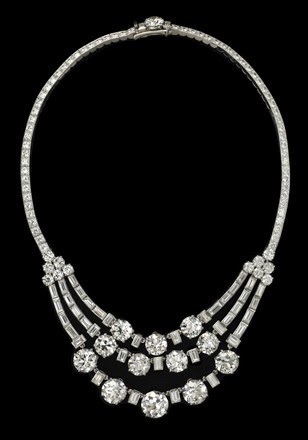 The necklace, along with Grace’s Cartier 10.47-carat engagement ring given to her by Rainier, are currently on display at the Denver Art Museum in the exhibit Brilliant: Cartier in the 20th Century. Oh you lucky Colorado babes! I know we are spoiled here in the city with terrific exhibits, and I count Set in Style: The Jewelry of Van Cleef & Arpels as one of the most amazing shows I have ever attended, but this Cartier exhibition, which has already showed in Madrid and Paris, is one I would love to see. You all know how I feel about Cartier so I would it would be a thrill to visit with iconic jewels once owned by the Duchess of Windsor, Elizabeth Taylor, María Félix (she of the jaw-dropping crocodile necklaces), and of course the incomparable Grace. Wearing the ring (or perhaps its stunt double) in her last film, High Society. If you saw the Cartier exhibit, whether in Denver, Madrid, or Paris, let me know what you thought of it. I am keeping my fingers crossed that it is coming somewhere close to me in 2015! Brilliant: Cartier in the 20th Century is on display at the Denver Art Museum until March 15, 2015. Definitely the age of elegance. I live in Denver and I will definitely be going to the Art Museum to see the Cartier exhibit! Are there any estimated prices these pieces would fetch even without the Grace Kelly provenance? Give us your expert appraisal Jill. High Soceity was good but To Catch A Thief one of my all time favs! Hi, Jill! Oh,what beautiful jewelry! I had an interesting and touching jewelry story this week. I was checking out at our local CVS, visiting with the clerk who is the mom of a couple of former students, when I noticed her beautiful wedding ring. It was a stunner! I commented and she told me that she and her husband had been together for 23 years. He had intended to get it for their 20th wedding anniversary but with kids in college and cars to buy, etc., they couldn't swing it then. But they could now! I was so happy for her and she was sooooo proud of it, and she should have been. I know that beautiful ring represented 20+ years of sacrifice and compromise and making do. I love "love"! From what I heard on Biography, she actually wore her engagement ring in High Society. Such a great movie and such an incredible legacy.